Until now, the surveillance cloud has been the province of IP upstarts and small companies pushing a new approach. The old guard incumbents have sit on the sideline. No more. Honeywell has made its move into the cloud with a new hybrid appliance and cloud service, MAXPRO Connect. But how good is it? In this note, we overview this new offering, its features and pricing, and how it compares to other cloud-based DVRs. 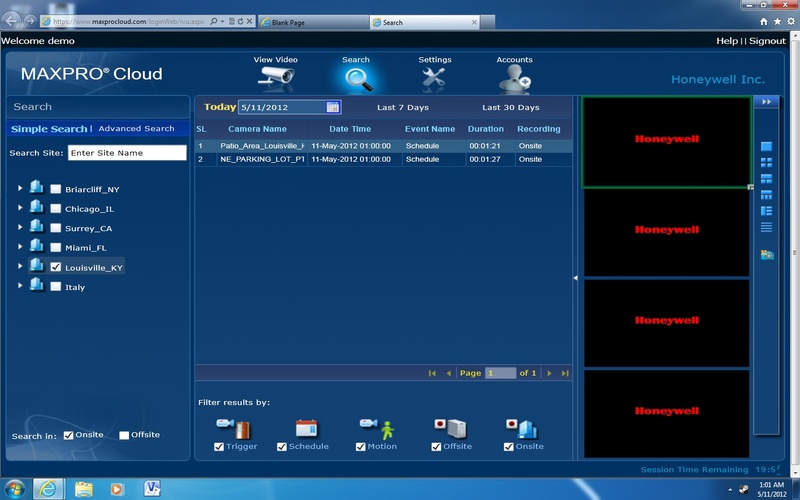 Remote access to live and recorded video via web interface or iPad/Android app using Honeywell's free MAXPRO Connect service. Supports 8 channels total, IP or analog. The rear of the unit contains 8 analog inputs (non-looping), as well as four PoE-enabled (802.3af) 10/100 LAN ports for connecting IP cameras. Additional cameras must be connected via external switch. Only Honeywell IP cameras are supported. 4GB solid state drive on-board, expandable by USB or NAS. Given the very small amount of on-board storage, external storage will almost definitely be required. Analog resolution is limited to CIF, while IP cameras may stream up to 720p. Total framerate is limited to 120 FPS at CIF on all channels. Honeywell does not specify, but this likely equates to 1-2 FPS per camera if all are 720p. 8 alarm inputs, two outputs, and one arm/disarm input. This allows the appliance to be used as a basic intrusion detection system, tying video to alarm events. Automatic discovery of Honeywell IP cameras. Network setup is performed automatically via UPnP. As we have reportedly previously, UPnP setup is not without problems, requiring manual setup if it fails. The appliance automatically connects to Honeywell's MAXPRO Connect service when connected. The MAXPRO Cloud Appliance is available now, with an MSRP of $1,899 USD. Based on this MSRP and online pricing of available products, we estimate a street price of $1,300-1,400. Additional screens allow for configuration of the appliance, and editing account settings. The free MAXPRO Connect service currently offers no off-site recording, simply remote access to local archives. An email notification is included at no charge for six months, providing notification of alarm and system health events via email. After six months, this service is offered for $3 per month per site. Future upgrades, later in 2012, will offer off-site storage of event video only (not continuous recording) for a monthly fee. The MAXPRO Cloud appliance and Connect service are similar to Lorex's approach to cloud access. Lorex provides free remote access to their DVRs (and IP cameras) via a third-party service, called Yoics. Both live and archived video are supported. Users may see our overview of the Lorex service for more information. Analog-only: Lorex does not offer hybrid recorders, only analog input. Lorex supports 4CIF/D1 resolution on analog ports, however. No alarm functions: While the Lorex line does have alarm inputs for each camera, these cannot be armed or disarmed via the unit, making them "always-on". Greater on-board storage: Lorex DVRs are available with 250GB HDDs, minimum, as opposed to Honeywell's 4GB. External storage is supported, but less likely to be required. The most expensive 8-channel Lorex DVR, the LH318321, sells online directly from Lorex for $699 USD, about half of what users should expect to pay for the MAXPRO Appliance (~$1,400). Even Lorex's most expensive 16-channel DVRs sell for under $1,000. Overall, we expect users will find the MAXPRO Cloud Appliance overpriced for its feature set. 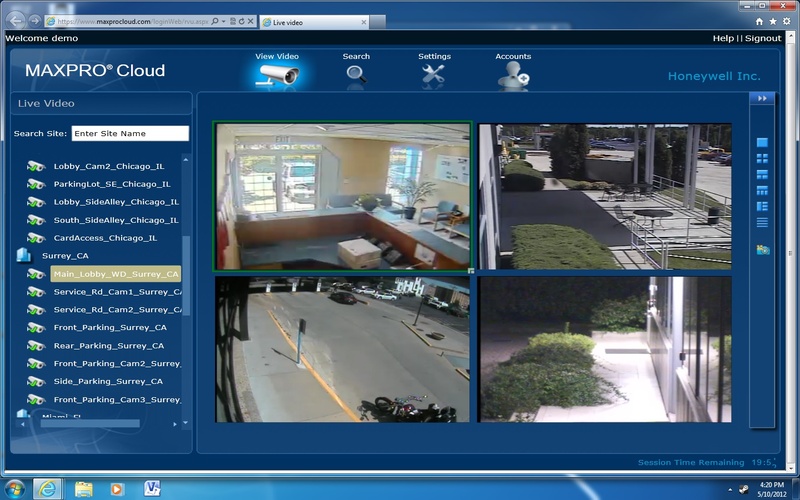 While it offers some interesting features, such as free cloud access and IP camera support, not found on most other cloud-based recorders, these advantages are tempered by its high price, limited frame rate when using IP cameras, no 3rd party IP support and low resolution when using analog cameras. Additionally, the minimal amount of on-board storage and lack of low-cost IP camera options from Honeywell further increase total price when megapixel is desired. The most important long term sign of this release is how big brands will integrate and offer cloud services as a complement to their existing products. Once this is done right with well positioned products (i.e., not this recorder), we see it as a powerful tactic to increase value and mitigate the competitive threat of VSaaS new entrants.